We have the Trunki Suitcase and our toddler absolutely loves having this ‘big boy case’! It was gifted to us by a good friend who knew the lowdown on kids suitcases and we have had a lot of great use out of it since. For one thing, the suitcase is basically an awesome ride-on toy, so there isn’t really anything better than that. My son loved riding on it in the airport and also loves to use it at home as well. I will say though that the suitcase is a bit more of a ‘for show’ type item as practically speaking I don’t find the Trunki to be all that useful for packing my son’s stuff. We usually let him put his toys for the airplane in it to keep him entertained as it doesn’t hold a lot and I find the locking mechanism a bit flimsy. A few times my son got bored of wheeling around on it in the airport and we had to lug it around with us. It wasn’t a huge deal as we always travel with our full-sized stroller so we had lots of space to throw it in the basket and go. I think the trunki is perfect if you are looking for something that is fun and cute which your toddler will enjoy and make them feel special while traveling. If you are looking for something with a lot of space, check out some of the other options below. I absolutely wish that this product had come out when my kids were still young enough to really use it. One of my friends bought this suitcase turned bed for her kids and she has absolutely rave reviews about it. The concept is simple. The suitcase has two purposes, it stores your stuff (duh!) AND it acts as a bed on the airplane by fitting in between the two seats. Such a brilliant idea! If you are going on a long haul flight with your little ones anytime soon, this suitcase should definitely be on your wish list. My friend traveled to Asia and said her 2-year-old had the best sleep of her life! Umm, can we figure out how to do this for adults as well? There is nothing worse than sleeping on a plane! These cute suitcases come in a variety of different themes including superheroes, Paw Patrol, and my favorite Hello Kitty. They are very lightweight and roll around with ease. Kids can pull them by themselves! 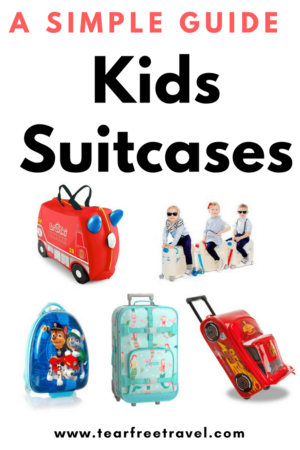 Toddlers love them because ‘they have wheels just like mommy and daddy’s suitcases.’ We have a few suitcases by Heys and I find that their brand it really high quality. I have never had any problems with their material and fasteners and when I did have to return an item once there was absolutely no hassle. These suitcases don’t hold a lot, but a perfect as a carry-on for your toddler or preschooler. They also come in a larger size for school-age children. This suitcase wins for practical purposes. It also gets rave reviews from a few of my close friends. It is large enough that you can actually pack the clothes your child will need for a short vacation in it. It can fit about 3-5 days of toddler clothes with a few personal items. It is also super cute, coming in a variety of animal patterns. They also have a lot of other accessories that come with the same patterns like lunch boxes and backpacks. We have this Skip Hop lunch bag and I find the quality incredible. We have been using ours for 3 years now and it is still in perfect condition. My son loves Cars and certainly this suitcase would top his list of must-haves in kids luggage sets. Made by Disney, this suitcase even had a button to press to hear the engine revving. I know my son would go nuts for this one! Perhaps it will be a Christmas gift in the near future. This suitcase is aimed at older children, the handle is likely too large for a 3 or 4-year-old. It is a carryon size and packs enough room for a few days worth of child-sized clothes. I love pottery barn backpacks and bought one for my son when he started Kindergarten this year. The quality is amazing and I love the personalization options. I don’t own a Pottery Barn suitcase but have had my eye on them for awhile. These pieces are built to last and grow with your child. Their luggage comes in two sizes, large and small, so pay attention to the dimensions when you are choosing your piece. Most of the suitcases offer an option for personalization, which is great for keeping track of your bags in the airport. I like that this luggage uses spinner wheels so a little one will be able to push/pull it themselves. Of course, kids luggage doesn’t have to be fancy, and my son has certainly gotten lots of entertainment lugging my suitcases up and down the airport hallways on our many trips. We like to shop at stores like Target and Marshalls for our luggage as I find they have high-quality pieces at great prices. 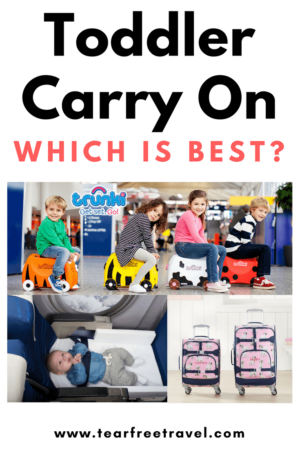 Buying adult sized carry-on luggage is still manageable for kids to handle themselves and is usually the more affordable option. Wonder what essentials you need for traveling with a toddler? Check out my post here. Do you have any favorite kids suitcases? Let me know in the comments below!